Special thanks for Ibrahim Atay for efforts on editing video. As you may know, Jeff Sutherland - the co-creator of Scrum and signer of Agile Manifesto- will be in Istanbul, Turkey on 16th - 17th January 2014. He will conduct Certified Scrum Master (CSM) course. This will be a unique opportunity for IT professionals and academics in Turkey and near region. Jeff Sutherland will also give a public talk to audience on 16th of January. Details will be announced on these pages soon. Barış BAL: First of all, thank you very much for accepting my request doing this interview. Let me start with the first question. You are the co-creator of Scrum and it is a methodology which is used by hundred thousands of people on thousands of projects all over the world. How do you feel about it? Jeff Sutherland: When people tell me it has changed their life and given them back time with their family, I feel really good about that. When the number of Scrum jobs in the United States approaches 10% of new job openings I feel we are really changing the world. When I see the data showing that 14% of waterfall projects are successful and 42% of agile projects are successful, I am upset that 58% percent of agile projects are still Bad Agile. We have got to fix this! Barış BAL: What were the reasons/concerns behind that forced you to invent Scrum methodology? Jeff Sutherland I was working with developers who were always late with buggy software. Management and customers were upset and developers were viewed as bad people. I wanted to make life better for developers, give them back free time, have managers ask them to go slower because it was like drinking from a fire hose they were going so fast. I wanted customers to be ecstatic. I wanted teams to go 10 times as fast with 10 times the quality so that more people could buy things because they cost 90% less and they were much better things than they were used to. I believed Buckminster Fuller when he said are all billionaires but do not realize it because of a distribution problem. People are acting in ways that restrict the flow of goods and services that leave large segments of the population impoverished. If we all worked together and shared our resources we would all have much more than we need to be happy people. Barış BAL: What do you think about the future of Scrum? Jeff Sutherland: I wrote a paper on the future of Scrum for Agile 2005. In it I showed how a team can deliver live software multiple times during a sprint. The fastest Scrum I know today is at Hubspot where they deliver 170 live feature updates per day and almost 300 new releases a day at peak. Scrum is the way Toyota does new product development. It is already spreading outside of software into devops and hardware engineering. The venture group I work with has many companies doing Scrum in sales, marketing, finance, and so forth. Scrum is spreading into non-profit groups. In many ways, it was motivated by my work with an organization based on Nobel Laureate Prof Yunus and the Grameen Bank. The Grameen Foundation is using Scrum in agriculture, healthcare, education, and finance in developing countries. The most exciting Scrum development I know of today, is in high schools in the Netherlands where the teachers are Product Owners and the students are Scrum teams (eduscrum.org). They finish their semesters’ work many weeks earlier and their grades are 10-20% higher with Scrum. They say learning with Scrum is faster, easier, and more fun. I told them their work is a model that could free millions of students all over the world from boring classrooms where kids where not having fun and not learning very much. They were an inspiration to me. 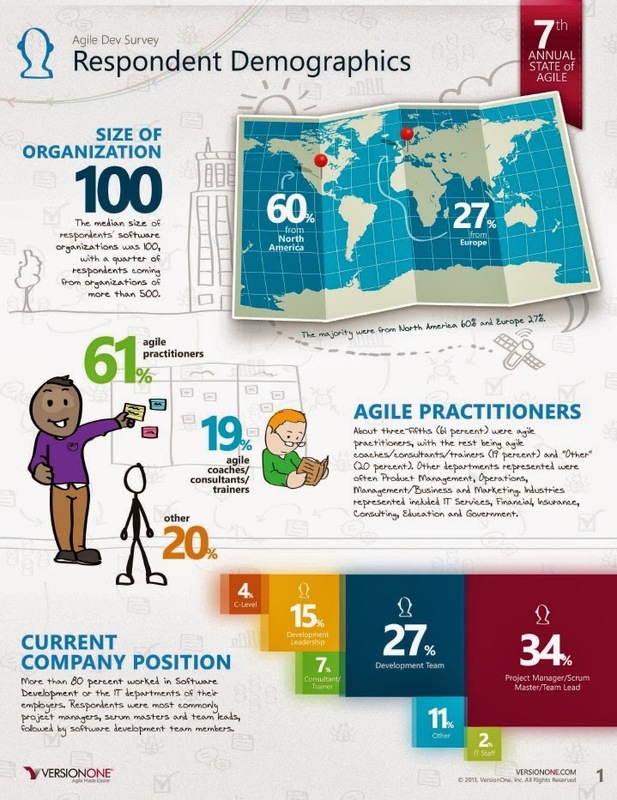 Her yıl Version One firması tarafından düzenli olarak yapılan "Annual State of Agile Development Survey" çalışmasının, geçen sene yayınlanan versiyonunu sizlerle paylaşmıştık. Her yıl yaklaşık olarak 5000 kişinin katıldığı dünya çapındaki anket kısa süre önce tamamlandı. Ayrıca Version One, bu yıl anketi cevaplayanlar arasından bir kişiye 3 Boyutlu Yazıcı veya 1,500 US $ nakit para ödülü, 2 kişiye iPad Mini, ve 3 kişiye Amazon Hediye Kartı hediye edecek. Anket sonucunda oluşturulan rapor yayınlandığında sizlerle buradan paylaşacağız.